Cilantro inspires some seriously strong feelings in people. When I first moved to California, having been raised on Arizona style Mexican food, I was appalled at the weird taste in the guacamole whenever I ordered it. I learned to love it in Asian food, and now have come to really love it. 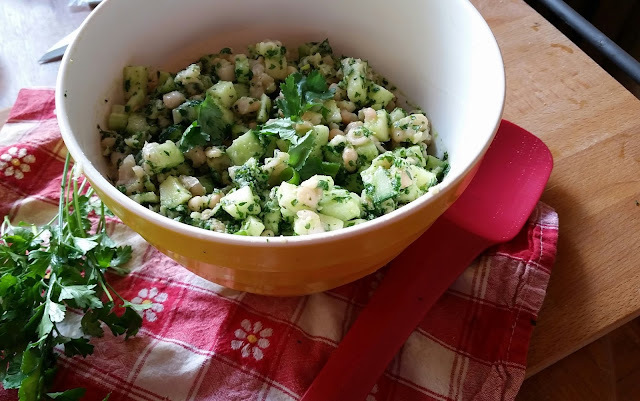 This salad and one I made up last summer are inspired by meals from my favorite takeout lunch spot in the Financial District in SF, Fleur de Sel. It's the kind of place where the food is not just made with great technique and ingredients, but with a lot of heart and soul. The recipe makes about 6 servings and only takes a few minutes once the beans are cooked and cooled. 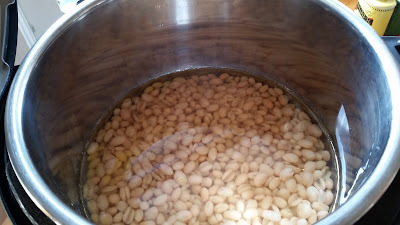 Start with 3 cups of white beans, cooked from about 1 cup dried or a little less than two cans. 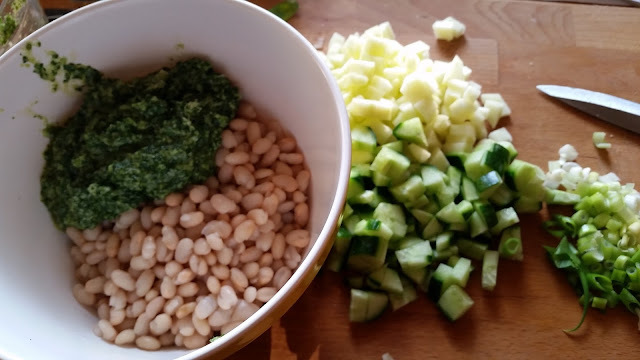 I like navy beans for this, but cannellini are fine, too. If you cook them from dried, let them cool to warm or room temp before mixing with the rest of the ingredients so you don't cook them. Drain the beans. 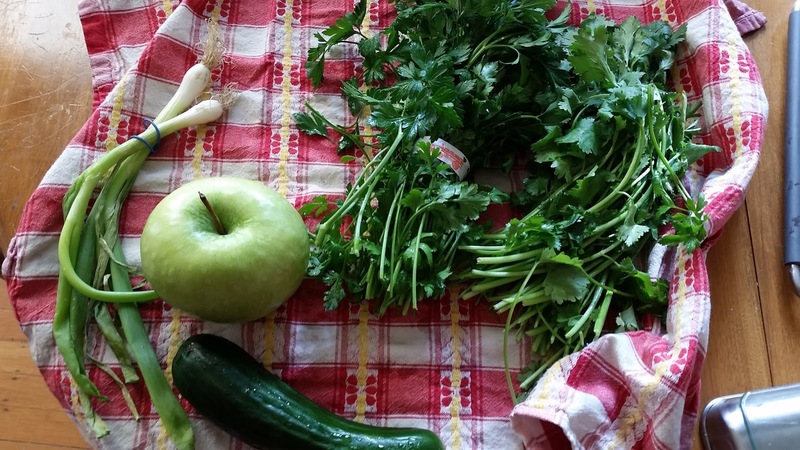 Wash and pat dry 1 bunch each cilantro and Italian parsley (or just one of the two, depending on your preference), 1 green apple, 1 medium/small cucumber, and two green onions. 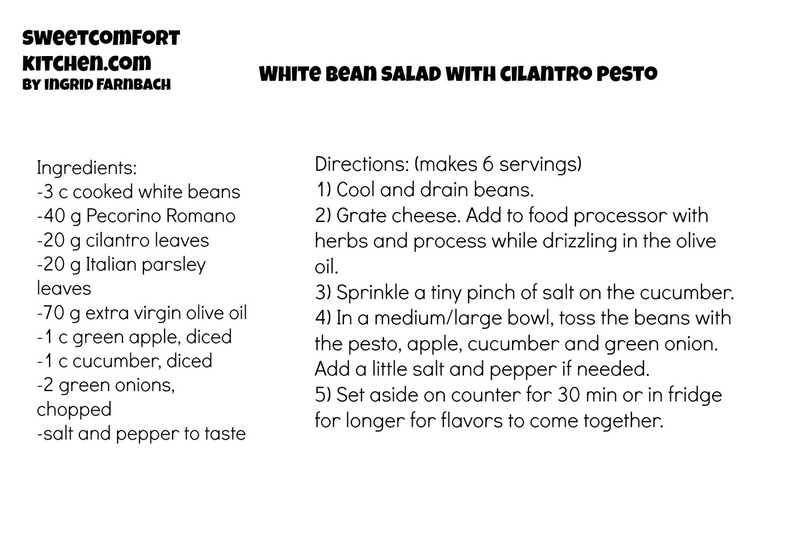 Weigh out approximately 40 g total of parsley and cilantro leaves and 40 g Pecorino Romano cheese. I'll show you measuring cup amounts after this pic, but I use weight to balance out pestos and pesto-type dressings. By weight, one part herbs to one part cheese, one part nuts if using and one and a half to two parts oil is the magic formula. 43 grams is close enough to 40 to work just fine. Grate the cheese using your tool of choice. 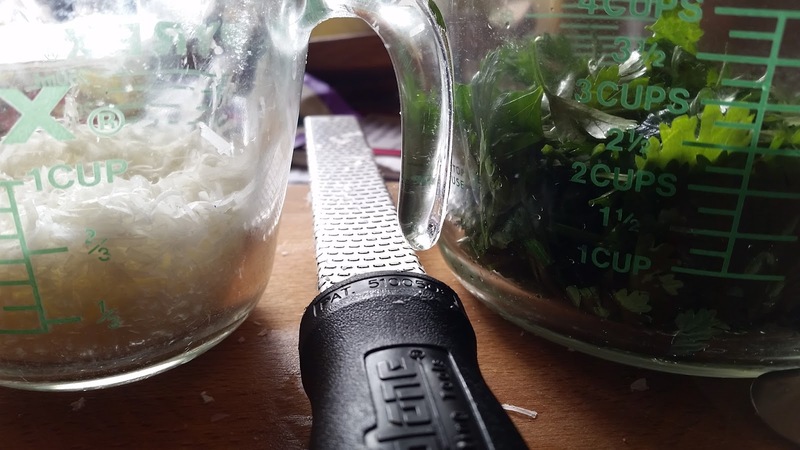 If you're using a measuring cup, it's a little harder to get closer with things like greens and cheese...if just grated into the cup, the gratings and leaves take up more volume than they do when they're packed. 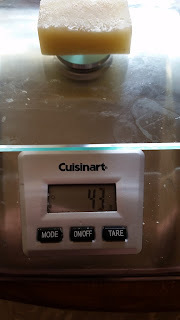 However, the weights worked out to about 2 c herbs and 2/3 c cheese, packed down a little but not too much. The approx. 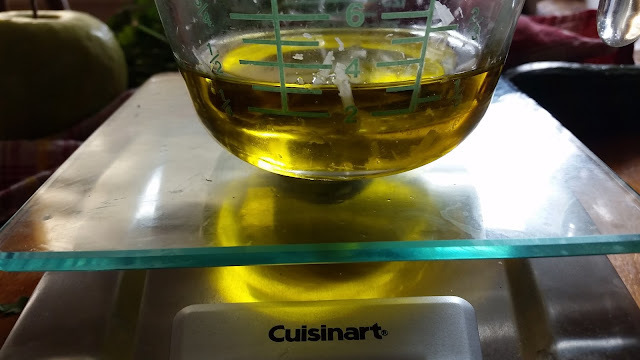 70 g olive oil worked out to 3/8 cup or 6 Tbsp. Put the cheese and herbs into a food processor and blitz while you drizzle in the oil, about a minute. If you don't have a food processor, you can finely mince the herbs with a chef's knife. Peel and dice the apple and cucumber to make about 1 cup of each (I half-peeled the cucumber), sprinkle the cucumber with a teensy pinch of salt, and chop up the green onions. Stir them with the pesto into the beans and then taste for salt and pepper. You probably won't need more salt because the cheese is very salty, but it'll depend on your taste and your ingredients. Set aside for at least 30 minutes if you can to let the flavors come together. Serve cold or room temperature and enjoy! Great with whatever protein you like.